Deer Camp Coffee “Opening Day” by Buck Baits makes the morning in hunt camp or at home just that much more special. 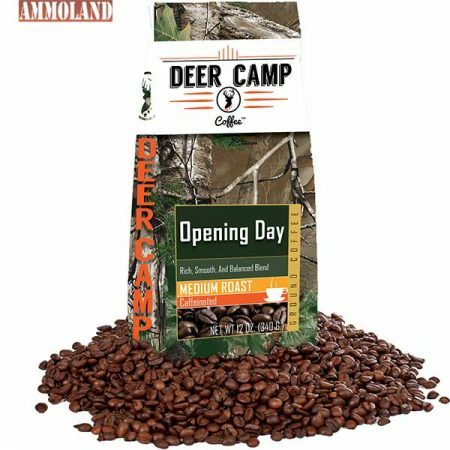 COLUMBUS, Georgia –-(Ammoland.com)- Deer Camp Coffee “Opening Day” by Buck Baits makes the morning in hunt camp or at home just that much more special. Packaged in 12-ounce Realtree Xtra camo bags and ground for easy enjoyment, the coffee is 100% Arabica and a propriety blend of Central American and Indonesian coffee beans, medium roasted to perfection. Deer Camp Coffee comes in both caffeinated and decaffeinated versions. The decaffeinated coffee goes through the natural Swiss Water decaffeination process. Swiss Water decaffeinated coffee process uses the elements of water, temperature and time to create some of the most intriguing decaf coffees. Once completed the coffee is 99.9% caffeine free. The decaffeinated coffee goes through the natural Swiss Water decaffeination process. Start your morning or the hunt off right with the delicious aroma and flavor of Deer Camp Coffee Opening Day. This post Deer Camp Coffee Packaged in Realtree Xtra Green Camo appeared first on AmmoLand.com Shooting Sports News .